I have a customer who wanted a different frame for each month, I hadn't even thought of something like that; instead of cheese or beer of the month; you'll get a themed mini frame at the beginning of each new month throughout the year. She's going to keep it on her desk at work and each month she'll switch it out with the new one. Of course I mentioned it to my coworker and she wanted in too; she makes me laugh - she wants one of everything I make. 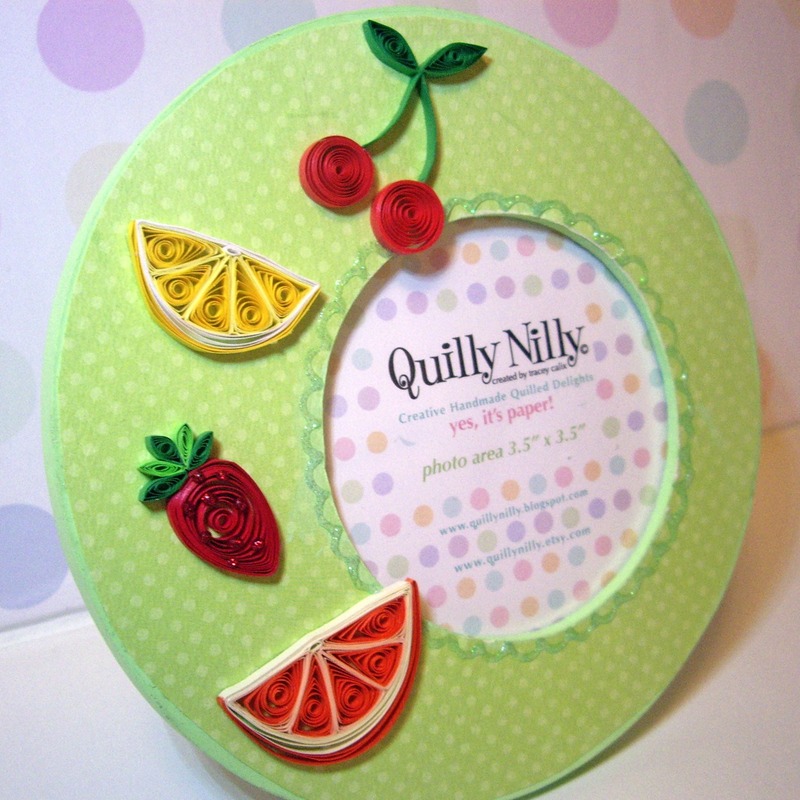 Here is the frame for the month of May, I'm still figuring out what I'll do for June although I'm thinking something sunny or fruity - since I think my bigger fruit frame turned out super cute. 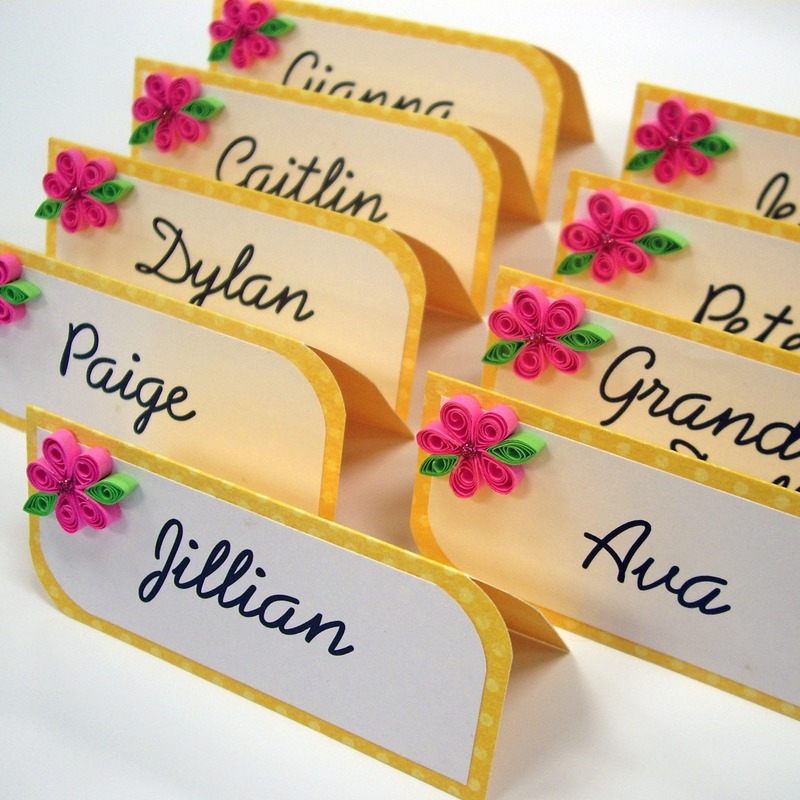 I wanted to share my latest custom order I received through etsy, it was for 39 table name cards in yellow and fushia. 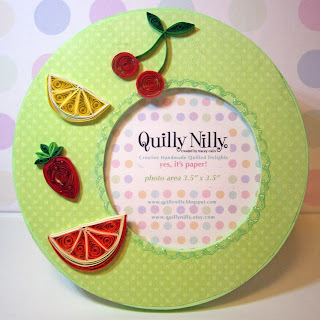 The cards themselves are from Bo Bunny's Double Dots card stock in Buttercup Yellow and the quilled flowers are a fushia color, I wasn't too sure about her color combination at first but when I finished and had all of them sitting in front of me I thought they turned out so pretty. I worked with Jillian showing her samples of the double dot papers to help her pick a card color, she asked if I could preprint the guest names; which was absolutely doable; I hope she's just as happy as I am with the end result. If you're interested in a set for your next gathering please feel free to contact me, I'd love to work with you to create the perfect little addition to your table setting. 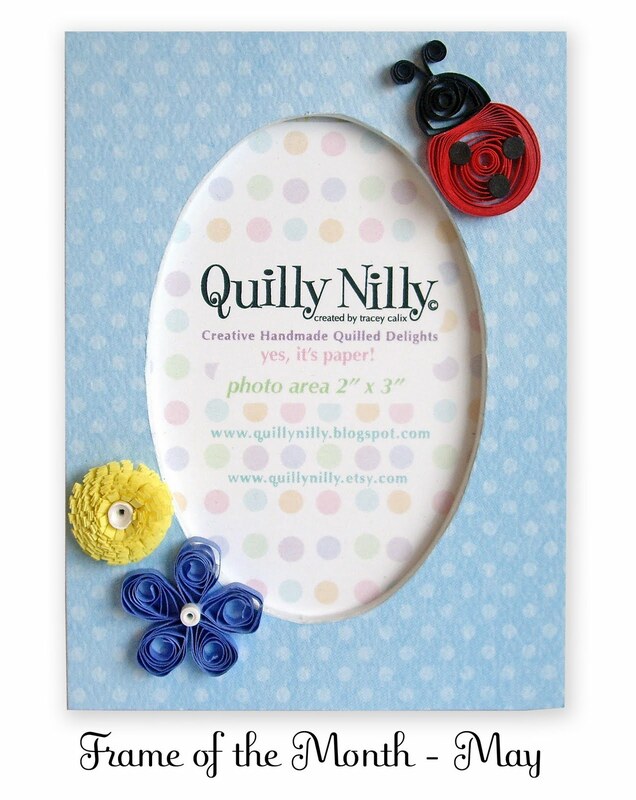 I mentioned in an earlier post that a Quilly Nilly product and the shop itself was being reviewed on a blog, well it's up - all I can say is thank you, Tiffany had some really nice stuff to say about my items and it was a great read. If you'd like to check it out and enter to win this yummy looking fruit frame please visit stuffparentsneed.blogspot.com. Good luck! I'll be back posting new projects I've been working on so see you soon. 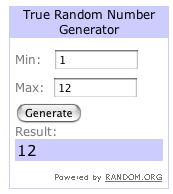 Thanks to the random number generator for helping pick a winner. 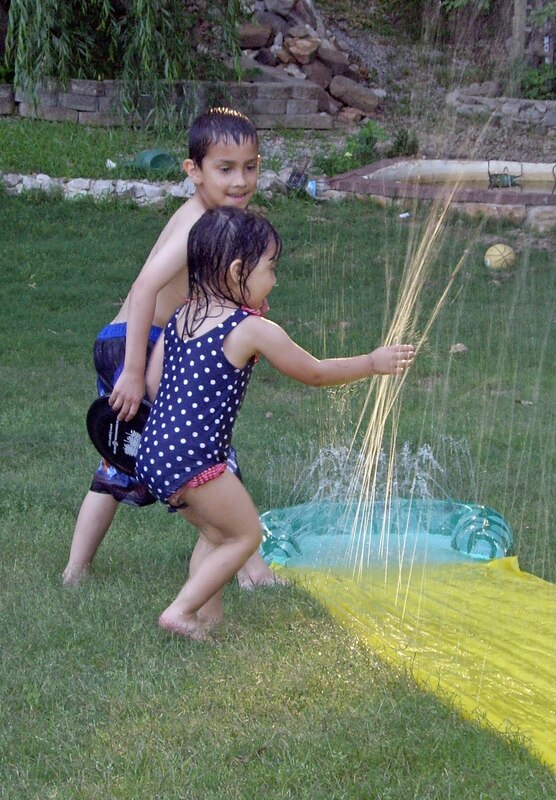 I really enjoyed reading the comments and suggestions from everyone and will definitely be doing this again in the near future. I also want to thank everyone who took the time to visit my shop and my blog, I know days are busy so I appreciate your time; have a fabulous week!